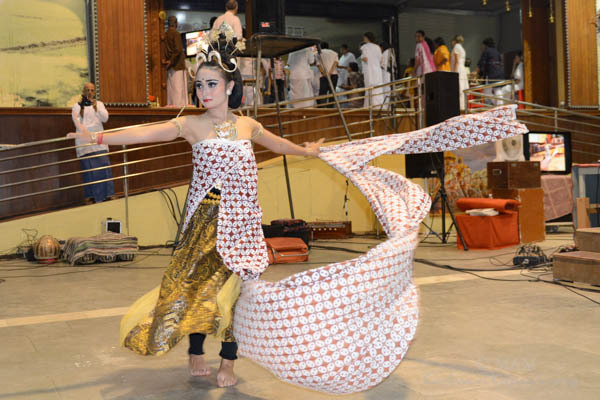 Amma’s children from Bali, Indonesia performed four beautiful classical dances during the darshan time. 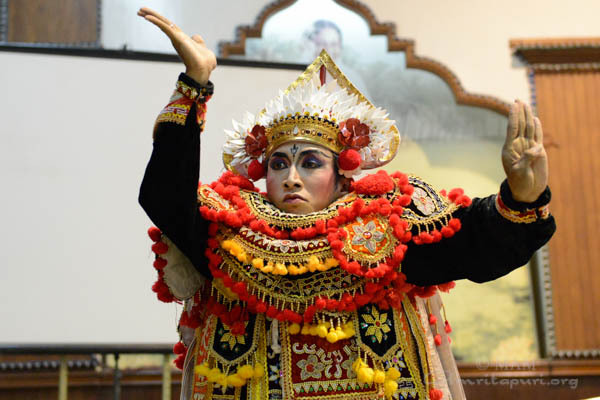 The dance from sacred Art Dharma Duta AGP lead by Indra Udayana, with the dancer Adi Suputra and Mila Rosinta of Bali, Indonesia. 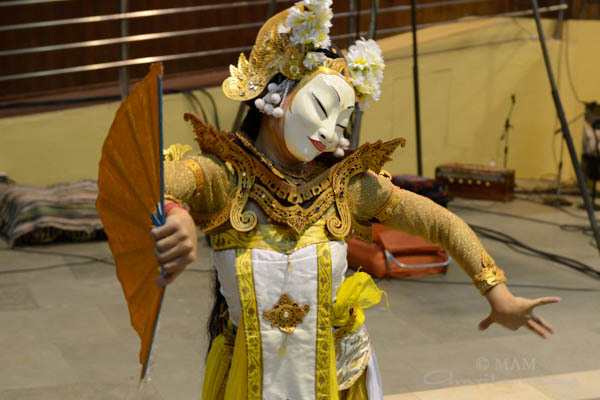 The classical Balinese dance and special dances performed were Tari Kawing – about women empowerment; Tari Baris – about the power of youth and hero in them; Tari Javuk – mask dance about humanism and leadership; and Tari Sthri Sakthi – a special dance created for Amma about Goddesses Saraswathi, Lakshmi and Parvathi. 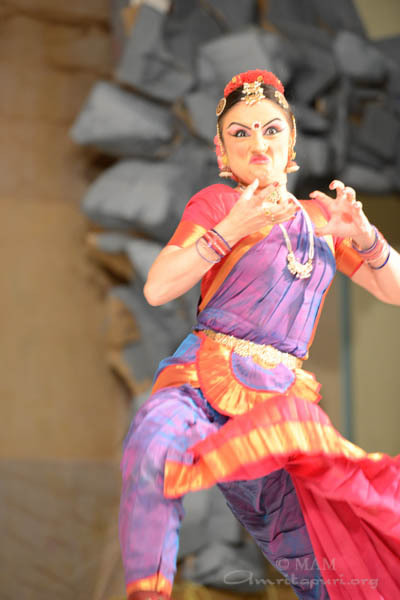 “Usually these classical dances are performed only in temples. But we present this here because Amritapuri is a temple” said Udayana. 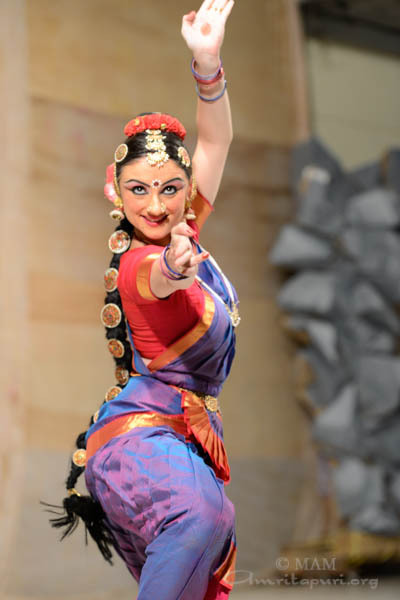 While presenting the dance Udayana requested Amma to come to Bali when she visits Singapore. 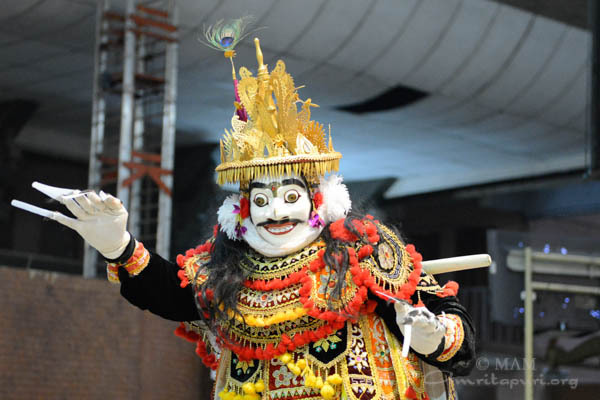 “If She comes there (Bali) in the morning, she can go back in the evening. If Amma dosent like that she can stay there for a day and give darshan. If Amma dosnet want to do that she can stay for two days. If Amma is not happy with it she can stay there for a week. But Amma, Pls come to Bali”, Udayana requested on the mike. Amma accepted that sweet prayer noding her head saying ‘yes’ while she is giving darshan. 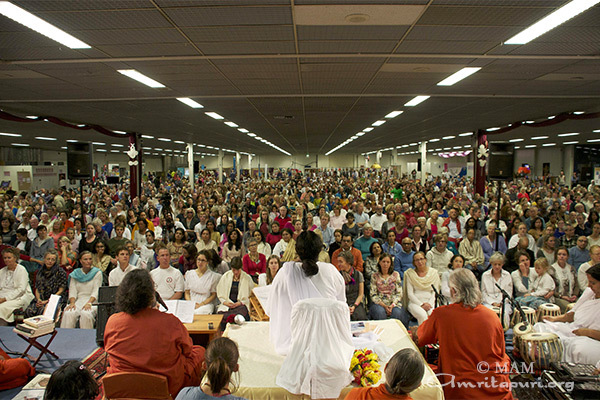 The Palau d’Esports in Granollers, the city situated in the outskirts of Barcelona, was the venue of Amma’s program in Spain held from November 13 to 15. Amma was accorded a grand welcome by hundreds of her Spanish children as she reached the venue, with the chanting of the chant “Ma Ma Ma…Jai Jai Ma Ma Ma” The sports venue was overflowing with people on all three days, and the patience of the Spaniards was amazing as they were ready to wait for hours to get a chance to meet Amma. On the first day, Amma was officially welcomed to Spain by Mr. Enric Vendrell, the Director General of Religious Affairs for the state of Catalunya, and by Mr. Josep Mayoral, the honorable Mayor of Granollers. On the third day of the program, taking into consideration the economic crisis of the country, Embracing the World made a contribution towards the Mayor’s fund to support poor school children in Granollers with food, amenities and psychological care. The check was handed over by Amma to Mayor Mayural. Speaking on the occasion, the Honorable Mayor thanked Amma and the organization for its kind gesture and mentioned about the different initiatives launched by the administration to take care of the people suffering due to the economic crisis. 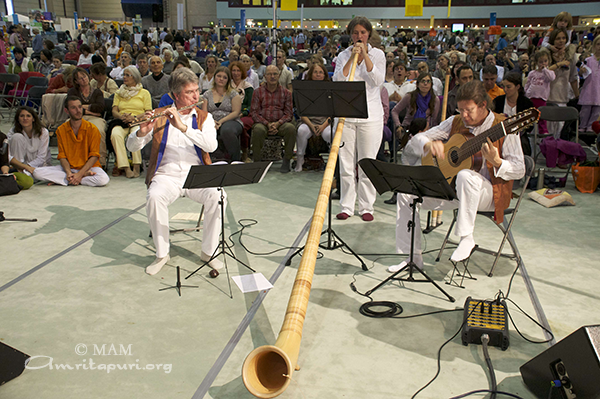 There was a feast of cultural programs on all the three days, which included Basque folk songs, piano recitals, a Gospel choir group, songs in Portuguese and Hebrew by groups from Portugal and Israel, and the inspired singing of devotional songs by the satsang groups from all over Spain. 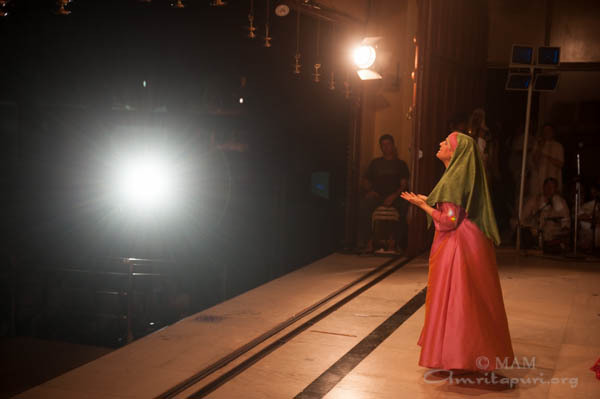 The whole hall was vibrant with joy and spiritual fervor all the time. The marathon darshan on the final day went on till 11 am the next day and as Amma got up from her seat, one could see hundreds of eyes moist with tears from the thought of missing her till the next time that they are in Amma’s presence. 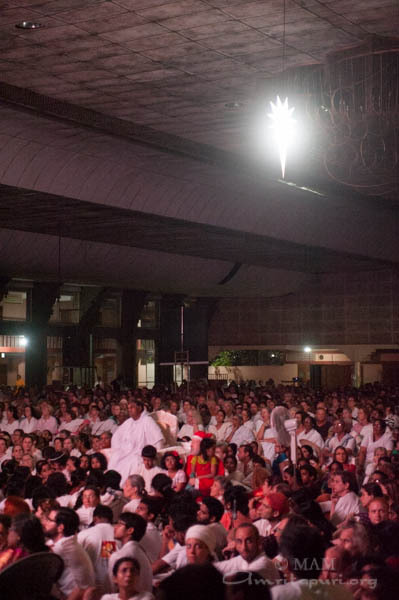 The shouts of “Gracias Amma” (Thank you Amma) and “Amma, te queremos” (Amma, we love you) filled the hall as Amma was walking out of the venue. She stopped on the way, playing with children, consoling those in wheelchairs, wiping the tears of some, patting the heads of some, and clapping hands with others. What an amazing tour it has been! Such grace to witness this divine ocean of Love flooding the continent of Europe with peace and harmony. From here Amma will travel to the United States to conduct programs in California and Michigan. 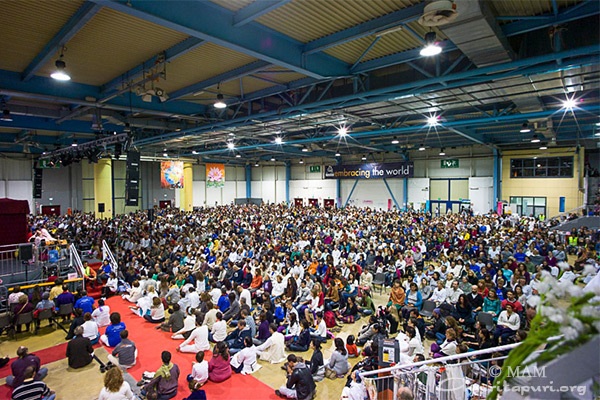 Milan, one of the largest urban areas in Europe, celebrated its turn to host Amma’s programs this year. The crowds in the previous program of Toulon were certainly large, but in Milan the crowds never stopped. 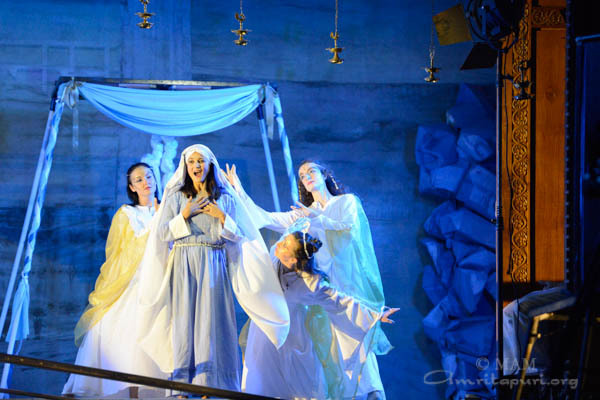 Every time Amma descended the staircase into the hall, there was a thundering applause and standing ovation from the audience at the Malpensa Fiere Exhibition Center. Every bit of the hall’s 30,000 square feet was full from the beginning of each program, and the crowd even overflowed and filled the adjacent hall of the same size. Every morning, Amma came exactly at 10 am and didn’t get up from her chair until after 5 pm. The “evening” programs ran almost until dawn the next day. When Amma would leave the hall after each program, devotees were lined up for hundreds of meters along the corridor out of the hall, just waiting for another glimpse of her smile or a touch of her hand. As Amma’s annual visit is a massive event for the region, the local media descended on the program hall en masse to cover the details. 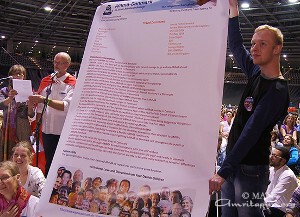 La Repubblica, the largest daily newspaper in Italy, ran an article entitled “30,000 in the queue for Amma – the embracing woman.” Articles also came in the national daily newspapers Il Giorno and Il Giornale, entitled “Embrace of Amma attracts a huge crowd” and “Cure for the world in crisis? The power of the embrace”. RAI (Radiotelevisione Italiana), Italy’s national public broadcast company and the second largest broadcaster in the country, featured the story of Amma’s visit in their evening news, which is received in 9 neighbouring European countries as well. 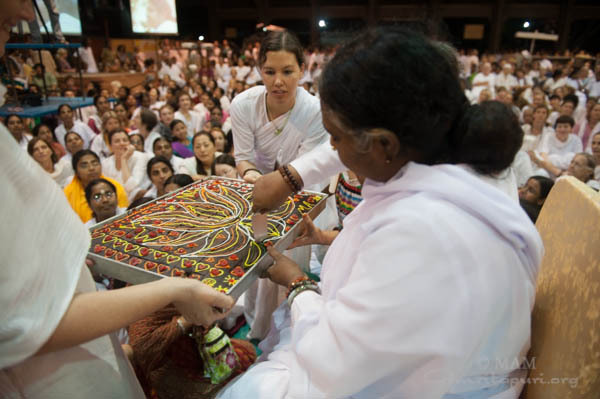 This year’s Milan program also provided various opportunities for the local devotees to express their love for Amma and to put her teachings into practice. From almost every province of Italy, there were cultural programs throughout the 3 days, including a Bharatnatyam dance, a sitar recital, and an ensemble of vocal and over 10 musical instruments all played by one man. Walking around the entire venue, one could see all the volunteers working joyfully, singing bhajans as a group and sharing in the joy of selfless service to humanity. An exhibition related to Amma’s InDeed program was set up along the entrance corridor, including an elaborate bird house made of recycled cans and various artwork made from waste materials. The local children’s group (Amrita Bala Kendra) performed a very impressive piece on the importance of preserving nature, receiving a huge applause from the audience afterwards. 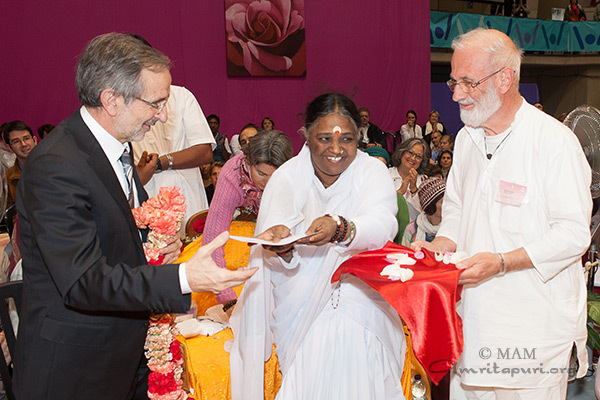 Like Toulon, the final evening program continued for over 15 hours until the last person received their hug from Amma. Amma’s boundless patience seemed like a live demonstration of the teaching she had given during her talk on the second night: “Those with patience achieve success in every field of life…. Love and patience are like two sides of the same coin. Patience is alertness, it is one-pointedness, it is awareness, it is devotion.” Through her patience and love, Amma had certainly succeeded once again in capturing the hearts of all those who came to see her this year. 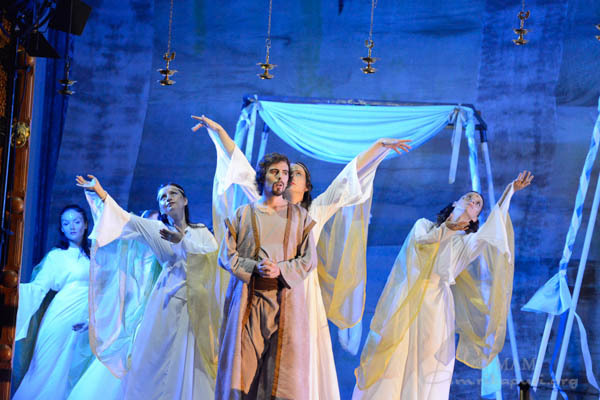 The coastal city of Toulon, France, was the ninth stop of the 6 week long 2013 Europe Tour. When Amma arrived at the Zenith Omega Hall after a ten-hour drive from Mannheim, Germany, it seemed as if the program had already begun, as hundreds of hard working volunteers stood waiting with candles, lamps and sparklers. They wished to offer a special welcome to Amma on the night of Diwali, the festival of lights, welcoming the divine light of Love to the South of France. 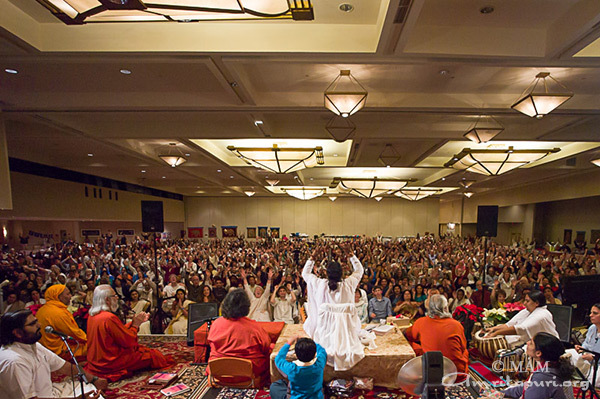 The following three days of programs became precisely that – a celebration of Divine Love. 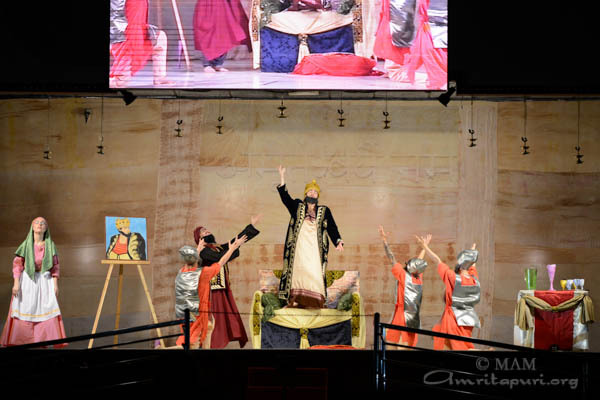 As usual, the programs in Toulon were some of the largest that Amma’s Europe Tour has ever seen. With a capacity of nearly 9000 people, the hall that has hosted internationally renowned stars such as Sting, Elton John, and Phil Collins, was full for all the three days of Amma’s program. On the morning of the first day, a major newspaper in the area, Var Matin, ran a huge report on Amma’s programs. On the front page of the newspaper, it read, Tous pour l’amour d’Amma (All for Amma’s Love) – Amma, la mere indienne qui embrasse le monde (Amma, the Indian Mother, who embraces the world”). Seemingly endless lines of people wound back and forth in front of the hall before the final evening program. Cultural programs that night included a Mediterranean fusion of Spanish vocals and African drumming, as well as an endearing bhajan session by a 3 year old French boy who sang a number of difficult bhajans, without even being able to read their lyrics. After the very last person received their darshan at 10:30 am, nearly 16 hours after the final program began, Amma’s last program in France this year came to a conclusion. As Amma was about to enter the caravan, there was a lady who had missed Amma’s darshan, having been caught in the morning traffic. Amma held her in a loving embrace and the smile on the woman’s face said it all. No sincere prayer can go unheard. Soon, the Tour caravan departed for its next destination… Milan. Upon arriving at the Maimarkt Halle from Holland, Amma spent her ‘day off’ by serving a Prasad dinner to all the local devotees and tour staff that had spent the day hard at work preparing the hall for Amma’s program. After personally distributing food to everyone, Amma shared jokes, sang bhajans and gave satsang as well. 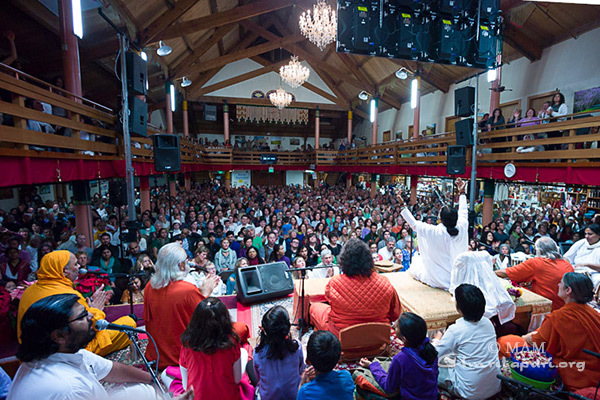 The first day of programs fell on ‘All Saint’s Day,’ a big holiday celebrated throughout Europe, which drew huge crowds to see Amma. 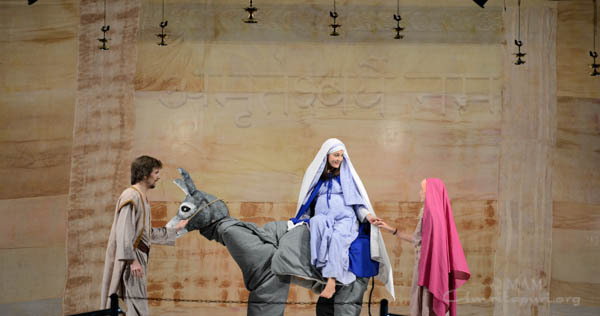 During the two days in Mannheim there was a continuous flow of people pouring into the hall. Throughout the programs several local musicians performed both traditional and contemporary offerings, including a trio of flute, classical guitar and an alp horn; and a jazz vocalist. 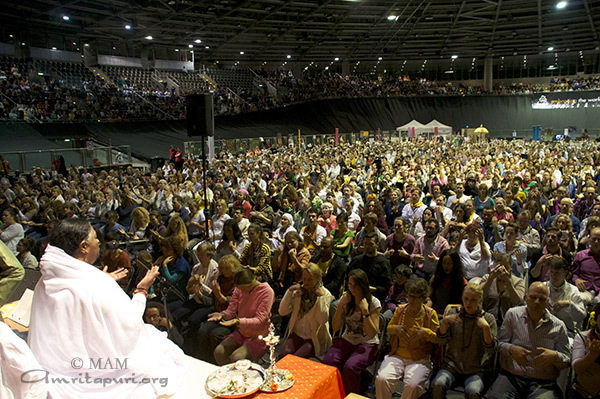 The final program in Mannheim coincided with Diwali, ‘the festival of lights.’ To welcome Amma to the hall for the evening program, rows of devotees stood holding lamps and waving sparklers. When Amma arrived on the stage, she was able to look out and see the 8000 square meter hall completely full of people. Since it was a weekend and the final program in central Europe before Amma heads down the to the Mediterranean coast, people came from all over the region to take part. 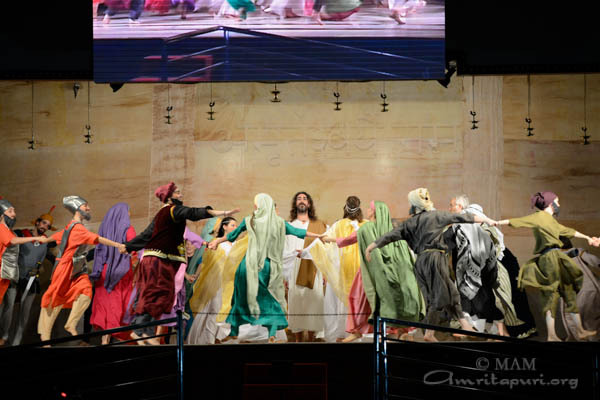 When Amma finally left the stage close to 10am the following morning, she and the tour group continued on to the next stop of the tour, 1000km away in Toulon France. 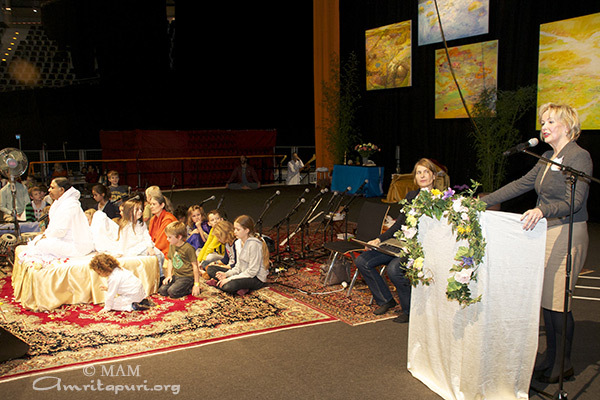 The Expo Houten, in the Netherlands, became the seventh stop of Amma’s 26th European Tour. 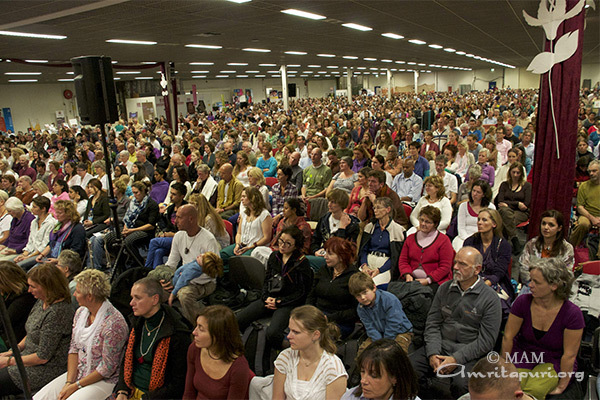 As Amma arrived at the hall on the evening before the program was to begin, rows and rows of Dutch devotees waited at the entrance to welcome her. After the hectic Berlin program, everyone expected Amma to immediately get some rest, but instead she went straight to the dining hall to sit with the devotes and serve them food. After the serving followed a beautiful satsang by Amma, where she reminded her children that spirituality is like a full time job. She said, “We need awareness in every thought, word and action, continually introspecting to make sure we are on the right path.” After this, everyone joined in unison when Amma began singing the bhajan Mrityunjayaya Namah Om. On the first day of Amma’s program, Holland was struck by the largest windstorm in 7 years, with powerful gusts of up to 100 kph, resulting in severe reductions to public transportation services. Despite such conditions, the hall was as full as ever and Amma’s darshan continued until after 1:30 am the following morning. The darshans on all three days went for long hours, but seeing the little ones dancing to the bhajan Sundari Jagan Mohini at the end of darshan one day, Amma herself stood up and joined them. 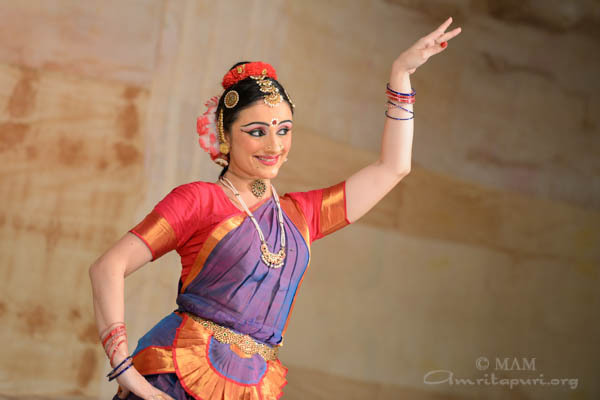 Soon, the entire hall was filled with mirth, swaying to the melodic tune and following Amma’s graceful steps. In her talks, Amma said, “One who has love for God will surely have compassion for those who suffer. Devotion and selfless service are not two but one; they are two faces of the same coin.” One could truly see the spirit of Amma’s teachings being put into practice by the combined team of Dutch and Belgian volunteers, who lovingly coordinated all aspects of the massive program. Devi Bhava was so crowded that all the partitions at the back of the hall had to be removed and the hall was completely full from wall to wall. The following morning the program ended after 8 am and Amma and the tour group proceeded to the Mannheim, Germany for the next stop on the tour.